DISCOVER THE MAGICAL WORLD OF CAROLYN RODNEY'S JEWELS, MADE OF GOLD AND DIAMONDS, PEACOCKS AND FLYING SAUCERS. AND LOTS OF HOLLYWOOD STARS. The beauty of a peacock on your neck, the mystery of a flying saucer on your fingers, the luxury disco glam of a pair of spinning balls on your ears. That’s the magic that designer Carolyn Rodney put in her self-titled jewelry line, made of beautiful, intricate, colorful pieces crafted in Jaipur, India. Stunning jewels that have won the praises of Hollywood A-list celebrities such as Charlize Theron, Brooke Shields and Tyra Banks. Moreover, Carolyn Rodney is part of Hollywood… find out why. What got you into jewelry? My love affair with jewelry started when I was a child playing with a big bag of my grandmother’s mostly broken costume jewelry. I would spend hours combining old necklaces and gluing loose stones to create my own designs. They were awful but she told me how fabulous they were. Later, on my first trip to India 12 years ago I fell in love with traditional Indian jewelry. I designed a couple of pieces and had them made while I was there. When I went back to NY where I was living at the time, some people asked where I got them. I realized I could make a career out of this passion and went back to Jaipur and teamed up with some Indian jewelry manufacturers and created my first line. Are your ties with India and Jaipur still so strong? I still manufacture most of my jewelry in Jaipur in India and enjoy working with the skilled artisans who make everything for me by hand the same way they have done for hundreds of years. Often the stones I use are custom cut, which is prohibitively expensive to do in other places. I also manufacture my home furnishing products in India, in Bangalore. The level of craftsmanship is hard to achieve elsewhere. In fact, some of the embroidery techniques I use in my textiles are lost skills elsewhere in the world on a commercial level. For the past year I’ve been spending most of my time in Greece and have been inspired to create new pieces influenced by what I’ve experienced there. I hope to find a fine jewelry manufacturing partner in Greece to work with on some of the pieces I have in mind and I would also like to collaborate with a Greek fashion brand to create some pieces. I can be inspired by anything as long as it moves me on a visceral level. Sometimes it’s by nature; birds or clouds or water for example. I’m very interested in metaphysics and philosophy so often something I read can be the catalyst for a design. I am the daughter of an antique dealer so from an early I was exposed to many beautiful objects which have left a lasting impression. I spend a lot of time in museums and galleries looking at art and antiquities. I’m lucky that I’ve lived in Europe, the USA, the Middle East and Asia which has given me an appreciation for a range of cultural aesthetics and philosophies which often come together and inform my designs. 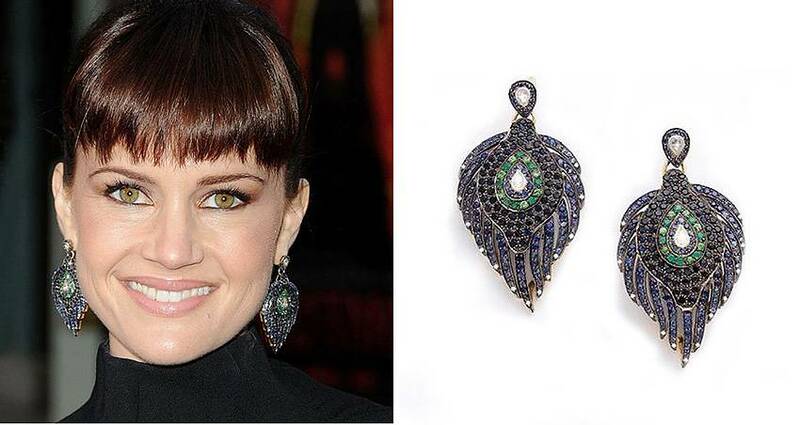 You work in film – sculptor, painter, set designer -: which is the influence of the movies in your work as jewelry designer? I’ve seen many films and love the art form so much that they have influenced me on a subliminal level. I remember the iconic jewelry worn by Audrey Hepburn in Breakfast At Tiffanys and the spectacular Bulgari jewelry worn by Elizabeth Taylor in Cleopatra. Designing for film, and interacting with the director is very different from designing jewelry for customers I don’t know. I do design custom pieces for clients which is closer to designing for film as it requires one to have a deep understanding of the person, just as you need a deep understanding of the character in film. But in film, it’s less about my own aesthetic dispositions and sensibilities. I love working in film and one of my ambitions is to collaborate with a costume designer on a film that features a lot of jewelry. What materials do you use mostly? I make most of my jewelry from 18 carat gold and precious stones; diamonds, emeralds, rubies and sapphires. Although, when I want more options with colour, I use precious stones combined with semi-precious stones. Some of the pieces in my new collections are made from 9 carat gold because I wanted a “duller” gold colour which to me looked and felt better for those particular designs. Your jewelry ranges from 2000 to 45,000 dollars: what are the best-selling pieces? My new collections are in the $1000 to $50,000 range. I’ve had a lot of interest in my Synergy collection which will be available to order in about 6 weeks time. The pieces are made from 9 carat gold and are very organic in form. I designed them to be worn in several different ways and to work with anything from a pair of jeans and a leather jacket to a backless couture evening gown. My peacock feather necklace has been my best seller but customers also love my circles and squares necklaces and my flying saucer and spinning ball rings. And what are the celebrities favorite pieces? I’ve been lucky that lots of celebrities have worn my jewelry at red carpet events like The Oscars, The Golden Globes and The Emmys. They seem to go for the statement pieces like my peacock bangles, peacock feather necklace and peacock feather earrings and my diamond spinning ball earrings. Where we can find your jewels? The new collection will be available at Roseark in LA, Nine-Eighteen in Dallas and one of the big department store chains in the USA (to be announced). The line will also be available in London and in Athens. Who is the woman who wears a Carolyn Rodney jewel? My customers are women of all ages and I try very hard to make sure everything I design is both fashionable and timeless. Many of the pieces I designed in my first collection are still very popular and sell well twelve years later. I think the woman who wears my pieces understands beauty and quality, has an independent spirit and mind and invests in pieces that can be worn forever. You’re English, living in USA and Europe, with a strong bond with India: where your globetrotting life is taking you now? As I already said, I am spending most of my time now in Greece. I absolutely love it. The people I’ve met there are some of the warmest and most generous I have encountered anywhere in the world. Their appreciation of the arts and culture makes me feel very at home and inspires me to want to design lots of beautiful things. Greece is without doubt one of the most beautiful places on earth and the history and culture are a constant great source to draw on creatively. You have a globetrotting life, you’re a citizen of the world: but in what do you feel strongly British? I will always consider London my home even though I have now spent more than half of my life living elsewhere. It’s where I grew up and was educated and where I still have many close friends and family. I still drink at least 6 cups of tea a day and I never travel without an umbrella so I guess there are some cultural traits that I will never lose. For me the greatest things about Britain is its long history and appreciation of the arts and of artists and also the ironic disposition of most British people. I am still very influenced by the encouragement I received as a child growing up in London to express myself creatively and never take myself too seriously. SCOPRITE IL MAGICO MONDO DEI GIOIELLI DI CAROLYN RODNEY, FATTO DI ORO E DIAMANTI, PAVONI E DISCHI VOLANTI. E TANTE STELLE DI HOLLYWOOD. La bellezza di un pavone sul collo, il mistero di un disco volante alle dita, il luxury disco glam di un paio di spinning ball alle orecchie. Il tutto in diamanti, oro e pietre preziose. Questa è la magia che la designer Carolyn Rodney mette nella collezione di gioielli che porta il suo nome ed è fatta di pezzi bellissimi, complessi e colorati, realizzati a Jaipur, in India. Gioielli scenografici che hanno conquistato le dive di Hollywood come Charlize Theron, Brooke Shields e Tyra Banks. D’altronde Carolyn Rodney è di casa a Hollywood… scoprite perché. Come e quando hai cominciato a disegnare gioielli? Il mio amore per i gioielli è nato da bambina, con un’enorme borsa contenente gioielli di scena di mia nonna, per la maggior parte rotti. Passavo ore a mettere insieme vecchie collane e a incollare le varie pietre sparse qua e la, dando vita a creazioni tutte mie. Erano veramente brutte, ma la nonna mi incoraggiava dicendomi che erano assolutamente favolose. Poi, 12 anni fa, sono andata in India per la prima volta e mi sono innamorata dei gioielli tradizionali indiani. Mentre ero li ho disegnato un paio di pezzi e me li sono fatti realizzare. Quando sono tornata a New York, dove vivevo all’epoca, in molti mi hanno chiesto dove li avevo presi. È stato allora che ho capito che da questa passione poteva nascere un lavoro vero e proprio, così sono tornata a Jaipur e, in collaborazione con alcuni laboratori di gioielli locali, ho creato la mia prima collezione. I tuoi legami con l’India sono ancora così stretti? Si, produco ancora la maggior parte dei miei gioielli a Jaipur, adoro lavorare con questi artigiani bravissimi che fanno tutto a mano, proprio come hanno fatto per centinaia di anni. Spesso le pietre che uso hanno un taglio personalizzato, in altri posti i costi sarebbero proibitivi. Produco anche la mia linea per la casa in India, a Bangalore. Il livello di artigianalità che c’è lì è difficilmente raggiungibile in altre parti. Infatti, alcune delle tecniche di ricamo che io uso nei miei tessuti non le trovo da nessuna parte nel mondo. L’anno scorso l’ho trascorso per la maggior parte in Grecia e la mia esperienza in questo paese mi ha inspirato a creare nuovi pezzi. Spero di trovare dei laboratori artigianali in Grecia con cui produrli. Mi piacerebbe anche collaborare con un brand di moda greco per creare insieme alcuni gioielli. Posso essere ispirata da tutto ciò che fa muovere qualcosa dentro di me. A volte è la natura: gli uccelli o le nuvole o l’acqua per esempio. Sono appassionata di metafisica e filosofia, così può essere qualcosa che leggo ad ispirare un nuovo pezzo. Sono figlia di un antiquario e sin da piccola sono stata circondata da oggetti bellissimi che hanno lasciato su di me un’impronta indelebile. Passo molto tempo nei musei e nelle gallerie, a contatto con l’arte e l’antichità. Mi sento fortunata ad aver vissuto in Europa, America, Medio Oriente e Asia. Ciò mi ha permesso di conoscere ed apprezzare estetiche e filosofie diverse, che spesso confluiscono insieme nelle mie creazioni. Lavori nel cinema come set designer: in quale misura il mondo del cinema influenza le tue creazioni? Amo il cinema in generale e ho visto tanti film che, nel tempo, hanno influenzato profondamente il mio lavoro di designer di gioelli. Ricordo ancora i gioielli iconici indossati da Audrey Hepburn in Colazione da Tiffany e quegli spettacolari gioielli Bulgari indossati da Elizabeth Taylor in Cleopatra. Lavorare per i film e interagire con il regista è totalmente diverso dal disegnare gioielli per clienti che non conosco personalmente. Realizzare gioielli personalizzati per qualcuno – cosa che faccio spesso – è molto più vicino al fare design per il cinema perché richiede una profonda comprensione del cliente, esattamente come lavorare in un film richiede una profonda comprensione del personaggio. Nel film, però, il mio gusto e la mia sensibilità estetica sono in secondo piano. Amo lavorare nel cinema e uno dei miei sogni è di collaborare con un costume designer in un film che abbia per protagonisti i gioielli. Quali materiali usi per i tuoi gioielli? Per la maggior parte dei miei gioielli uso oro 18k e pietre preziose: diamanti, smeraldi, rubini e zaffiri. Quando voglio avere una maggiore scelta nei colori, uso pietre preziose insieme a pietre semi-preziose. Nella nuova collezione ho fatto alcuni pezzi in oro 9k perché volevo un colore più “spento” che, a mio avviso, rendeva meglio su questi modelli in particolare. I tuoi gioielli vanno dai 2.000 ai 45.000 dollari: quali sono i pezzi best seller? La mia nuova collezione parte dai 1000 e arriva ai 50.000 dollari. È la collezione Synergy e sarà pronta all’ordine tra 6 settimane circa. I pezzi sono in oro 9k e hanno delle forme molto organiche. Possono essere indossati in vari modi e con qualsiasi cosa, da un paio di jeans e giacca di pelle a un abito da sera di alta moda. La collana con la piuma di pavone resta il mio best seller, ma le clienti amano anche le collane circolari e quadrate e gli anelli a forma di disco volante o con le spinning balls. E quali sono i modelli preferiti dalle celebrities? Mi sento molto fortunata perché molte celebrities hanno indossato i miei gioielli sui red carpet degli Oscar, dei Golden Globes, degli Emmy. La scelta è caduta soprattutto sulla serie Pavone: i bangles, la collana e gli orecchini con la piuma. Ma anche gli orecchini di diamanti con le spinning balls sono fra i preferiti. Dove possiamo trovare i tuoi gioielli? In USA i miei gioielli sono da Roseark a Los Angeles, da Nine-Eighteen a Dallas e stanno arrivando anche in un grande department store (lo annuncerò a breve). La nuova collezione sarà presto disponibile anche a Londra e ad Atene. Chi è la donna che indossa un gioiello Carolyn Rodney? Le mie clienti sono donne di tutte le età. Cerco sempre di creare gioielli che siano alla moda e, contemporaneamente, senza tempo: alcuni pezzi disegnati per la prima collezione vendono benissimo ancora oggi, 12 anni dopo. La donna che indossa i miei gioielli ha una profonda conoscenza della bellezza e della qualità, una mente libera e uno spirito indipendente e sceglie di investire in gioielli che possono essere indossati per sempre. Sei Inglese, vivi tra gli USA e l’Europa e hai un forte legame con l’India: dove ti porterà ancora questa tua vita nomade? Attualmente trascorro la maggior parte del mio tempo in Grecia. La adoro. Qui ho conosciuto le persone più calde e generose che abbia mai incontrato in qualsiasi altra parte del mondo. Apprezzano profondamente l’arte e la cultura e ciò mi fa sentire a casa, oltre che ad inspirarmi. La Grecia è senza dubbio uno dei posti più belli sulla terra e la sua storia e la sua cultura sono una grande fonte da cui attingere. Sei una cittadina del mondo: ma in cosa ti senti fortemente Inglese? Anche se ho vissuto più della metà della mia vita in giro per il mondo, la mia casa rimane Londra. È dove sono cresciuta e sono stata educata e dove ho ancora amici cari e la mia famiglia. Bevo almeno 6 tazze di tè al giorno e non esco mai senza ombrello: queste sono le caratteristiche inglesi che non perderò mai. Ciò che amo dell’Inghilterra sono la sua lunga storia, l’amore per l’arte e per gli artisti e l’ironia tipica del suo popolo. Non dimenticherò mai ciò che mi hanno insegnato da piccola a Londra: ad esprimere sempre la mia creatività e a non prendermi mai sul serio. Next Post WELCOME TO TIRELLI, THE ATELIER THAT MAKES OSCAR WINNING COSTUMES. ARE YOU READY TO TAKE A TRIP IN THE COSTUME HISTORY?